When we were contacted by the homeowner, she was in need of a pool heater repair. Based on her wanting the heater back up and running as soon as able, we scheduled for a service call right away. When we arrived at the pool heater diagnostic, we knew it was going to likely need to be replaced. This Pentair MiniMax NT pool heater was discontinued years ago as they were very problamatic. When looked to see what the condition of the pool heater was and determined it was not worth repairing. We contacted the homeowner to discuss the issues and she mentioned it had been worked on multiple times before. Once that was determined and from what we saw, she decided it was time to replace it. Based on her specific needs and space, we recommended installing the Raypak 406A pool heater. As with all pool customers, we always send a written estimate for all worked discussed. 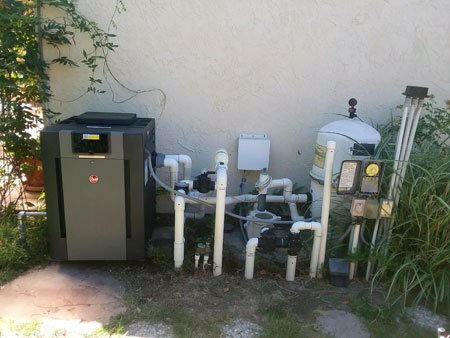 Once she received the estimate she confirmed and was ready to replace the old pool heater. From there, we order the pool heater and let the customer know when we can be out. As this is a common product, we were able to schedule to replace the old pool heater the next day. When we look to install a new pool heater, we always check to see how much room is available. This is due to certain pool heaters are larger than others. 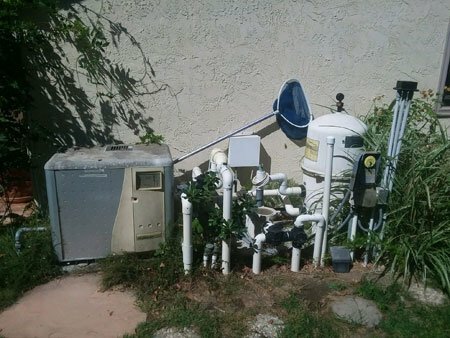 And when it comes to installing a Raypak pool heater for this Encinitas homeowner, there was plenty of space. Raypak pool heaters are the largest pool heater that we install and it is the only atmospheric pool heater. As with all of the other pool heaters installed, they are non-atmospheric, low NOx pool heaters. Being a low NOx pool heater means that it might be a tiny bit more efficient but that comes with other issues. Non-atmospheric pool heaters installed require the use of a blower and they can require more frequent repairs. The benefit of these smaller pool heaters for the pool company is that they are smaller and lighter. Because of this, they do not often need two people to move the heater into place. As with the Raypak pool heater, it often requires two people based on it’s size and overall weight. Raypak pool heaters have had the same design for many decades minus changing the name every now and then. The reason for this is that the heater is a workhorse and holds up to time and the elements. One of the main reasons we install a Raypak pool heater is that it lasts. We have seen these pool heaters working that are 20 years or older. We have performed pool heater repairs on these heaters and have installed them for decades. When it comes to the best or most durable pool heater, you cant go wrong with a Raypak. It is not that the other pool heaters are bad, they are just another option. We really like the Jandy JXi and the Pentair MasterTemp. We install the Raypak more often but, they are all good options when replacing your pool heater. Regardless if you live in Encinitas or any other part of San Diego, any of these pool heaters will work for you. If you have any questions about repairing your pool heater or installing a new pool heater, we can help. Feel free to give us a call or fill out our contact form and we will contact you.